The Laṅkāvatāra Sūtra (Sanskrit: लंकावतारसूत्र) is a prominent Mahayana Buddhist sūtra. This sūtra recounts a teaching primarily between Gautama Buddha and a bodhisattva named Mahāmati, "Great Wisdom". The sūtra is set in Laṅkā, the island fortress capital of Rāvaṇa, the king of the rākṣasa demons. The title of this text roughly translates as "Scripture of the Descent into Laṅkā". 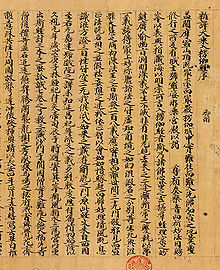 The Laṅkāvatāra Sūtra figured prominently in the development of Chinese, Tibetan and Japanese Buddhism. It is notably an important sūtra in Chan Buddhism and Japanese Zen. On the contrary my teaching is based upon the recognition that the objective world, like a vision, is a manifestation of the mind itself; it teaches the cessation of ignorance, desire, deed and causality; it teaches the cessation of suffering that arises from the discrimination of the triple world. The Laṅkāvatāra Sūtra describes the various tiers of consciousness in the individual, culminating in the tathāgatagarbha "buddha-womb" (i.e., buddha-nature) or "storehouse consciousness" (Skt. Ālayavijñāna), which is the base of the individual's deepest awareness and his tie to the cosmic. In the sutras the Bhagavan (aka Buddha) says that the tathagatha-garbha (womb of the Buddhas) is intrinsically pure, endowed with thirty-two attributes and present in the bodies of all beings, and that, like a precious jewel wrapped in soiled clothing, the ever-present unchanging tathagatha-garbha is likewise wrapped in the soiled clothing of the skandhas, dhatus and ayantas and stained with the stains of erroneous projections of greed, anger and delusion. The reason why the 'Tathagatas' who are Arhats and fully enlightened Ones teach the doctrine pointing to the tathagatagarbha which is a state of non-discrimination and image-less, is to make the ignorant cast aside their fear when they listen to teaching of egolessness. It is like a potter who manufactures various vessels out of a mass of clay of one sort by his own manual skill and labor ... that the 'Tathagatas' preach the egolessness of things which removes all the traces of discrimination by various skillful means issuing from their transcendental wisdom, that is, sometimes by the doctrine of the 'tathagatagarbha' , sometimes by that of egolessness ... Thus, 'Mahamati', the doctrine of the 'tathagatagarbha' is disclosed in order to awaken the philosophers from their clinging to the idea of the ego. Accordingly, 'Mahamati', the 'Tathagatas' disclose the doctrine of the 'tathagatagarbha' which is thus not to be known as identical with the philosopher's notion of an ego-substance. Therefore , 'Mahamati', in order to abandon the misconception cherished by the philosophers, you must depend on the 'anatman-tathagatagarbha'. The tathāgatagarbha or "Buddha-nature" doctrine has been interpreted as an expression of the doctrines of pratītyasamutpāda "dependent origination" and emptiness. While seemingly monistic in nature, describing the tathagatagarbha as eternal (nitya) and immutable (atman), this doctrine is ultimately based on emptiness. According to Japanese scholar Yamaguchi Susumu, the most important point in the tathagatagarbha literature is that "the pratitysamutpada is the tathagatagarbha." Likewise, Ichijo Ogawa argues that tathāgatagarbha is basically equivalent to emptiness and the nature of the mind which allows it to understand emptiness. This interpretation is based on a passage from the Ratnagotravibhāga, which states that "all sentient beings are possessed of the tathāgatagarbha". According to Asanga Tillekharatna, "it is generally believed that the sutra was compiled during 350-400 CE," although "many who have studied the sutra are of opinion that the introductory chapter and the last two chapters were added to the book at a later period." Four translations of the Laṅkāvatāra Sūtra were made from Sanskrit into the Chinese language between roughly 420 CE and 704, the earliest being attributed to Dharmarakṣa in the 5th Century. (p5) Of these, only three are now extant. Lankavatara Sutra, translated into English from the Sanskrit by D. T. Suzuki. Boulder, CO: Prajña Press, 1978, ISBN 0-87773-702-9, first published Routledge Kegan Paul, 1932. Red Pine has translated the Laṅkāvatāra Sūtra from a combination of Chinese versions. This translation was published in 2012 as The Lankavatara Sutra: Translation and Commentary. ^ Daisetz T. Suzuki, tr. The 'Lankavatara Sutra', Parajna Press, Boulder, 1978, pp.68-69. ^ Daisetz T. Suzuki, tr. The 'Lankavatara Sutra', Parajna Press, Boulder, 1978, pp.69. ^ a b c d e f g h i j k l m Suzuki, D.T. (1930). Studies in the Lankavatara Sutra. Translated by Ethel M. Coomaraswamy (1998 ed.). New Delhi: Munshiram Manoharlal Publishers Pvt. Ltd. ISBN 81-215-0833-9. ^ "The Korean Buddhist Canon: A Descriptive Catalog (T 670)". ^ "The Korean Buddhist Canon: A Descriptive Catalog (T 671)". ^ "The Korean Buddhist Canon: A Descriptive Catalog (T 672)". ^ Powers, John (2004). "Lankavatara Sutra". MacMillan Encyclopedia of Buddhism. 1. New York: MacMillan Reference USA. p. 456. ISBN 0-02-865719-5. Lindtner, Christian (1992). The Lankavatarasutra in Early Indian Madhyamaka Literature, Copenhagen. Asiatische Studien, XLV, 1, pp. 244–279. The Lankavatara Sutra BIONA online version at the Buddhist Information of North America website.